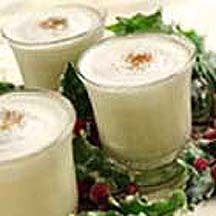 Spice up a holiday get-together with Michelle's first place winning Festive Green Tea Eggnog recipe. The Culinary Institute of America's Holiday Recipe Contest awarded Michelle's twist on a holiday classic beverage grand prize out of almost 250 entries. Combine eggnog, milk and Nestea in large punch bowl. Stir until well combined. Beat whipping cream in large mixer bowl until soft peaks form. Beat in sugar and vanilla extract until stiff peaks form. Stir into eggnog mixture. Mix just until whipped cream is nicely disbursed and frothy looking. Sprinkle with nutmeg.